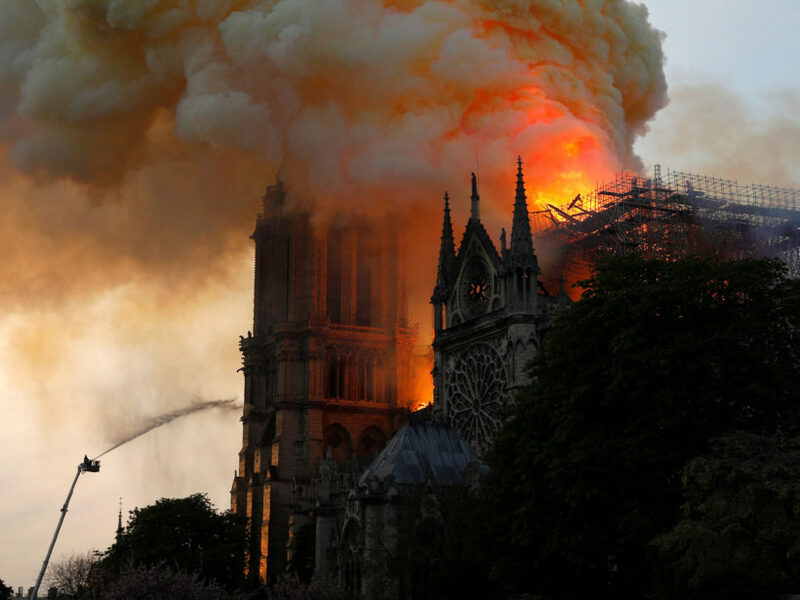 (by Sybille de La Hamaide, Julie Carriat, Reuters) PARIS — A massive fire consumed Notre Dame Cathedral on Monday, gutting and destroying the roof of the Paris landmark and stunning France and the world, but firefighters said they had saved the shell of the stone structure from collapse. Thousands of onlookers lined bridges over the Seine and along its embankments, held at a distance by a police cordon. 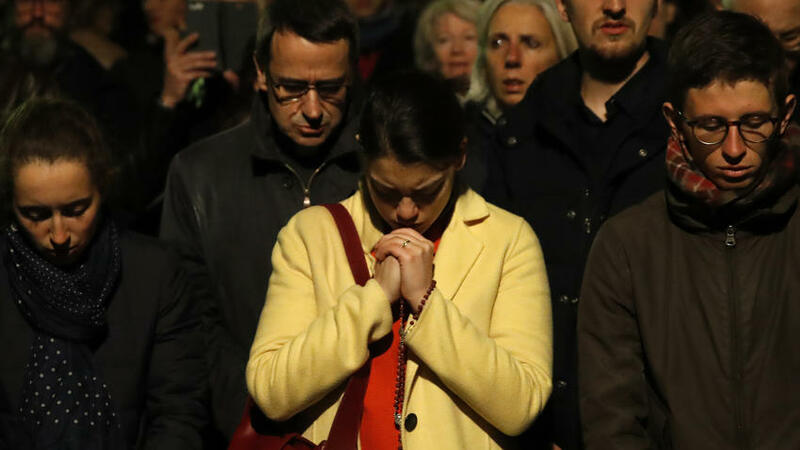 People pray as Notre Dame Cathedral burns in Paris on April 15, 2019. Notre Dame is a focal point for French Roman Catholics who like Christians around the world are celebrating Holy Week, marking the death and resurrection of Jesus. 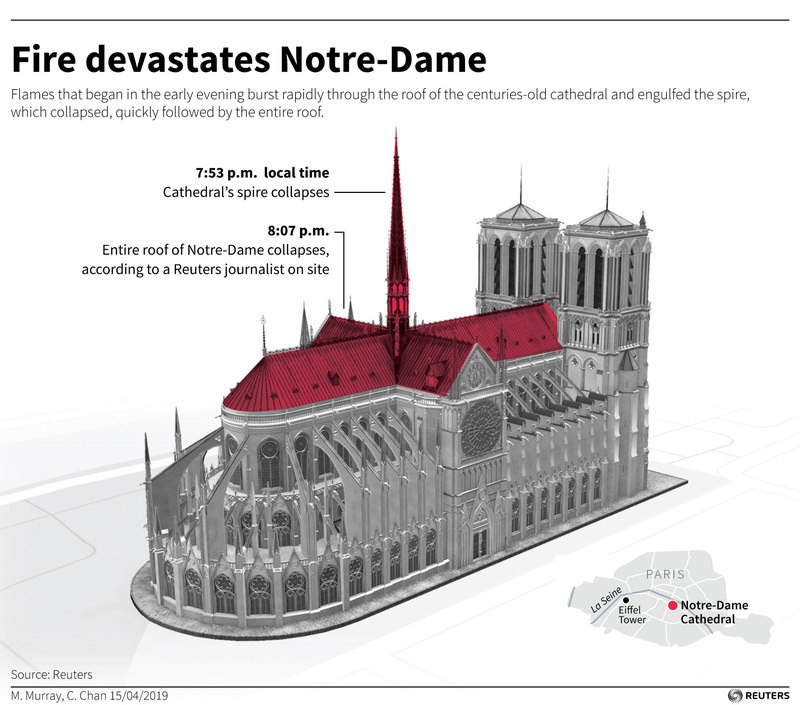 A centuries-old crown of thorns made from reeds and gold and the tunic worn by Saint Louis, a 13th century king of France, were saved, Notre Dame’s top administrative cleric, Monsignor Patrick Chauvet said. But firefighters had struggled to take down some of the large paintings in time, he said. 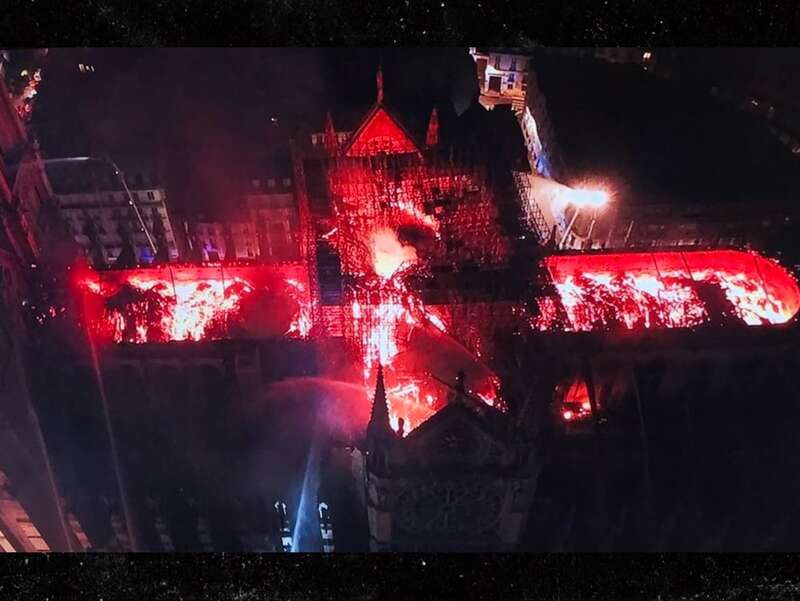 …The Vatican said the fire at the “symbol of Christianity in France and in the world” had caused shock and sadness and said it was praying for the firefighters. 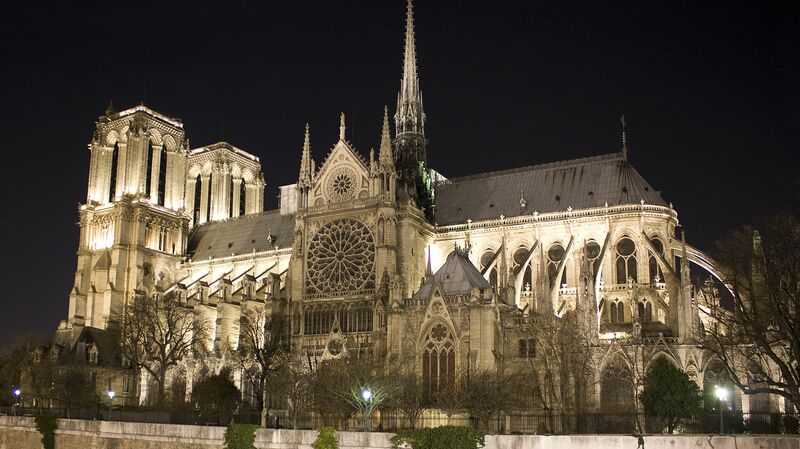 The cathedral, which dates back to the 12th century, features in Victor Hugo’s classic novel “The Hunchback of Notre Dame.” It is a UNESCO World Heritage site that attracts millions of tourists every year. 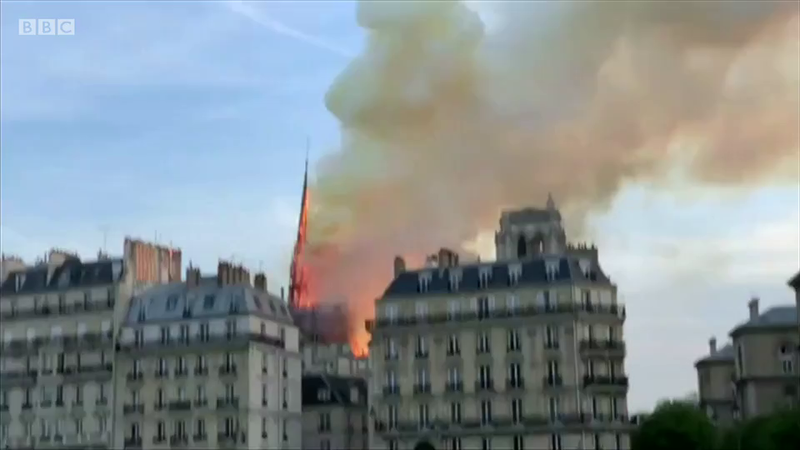 The archbishop of Paris called on all priests in Paris to ring church bells as a gesture of solidarity for Notre Dame. Published at Reuters .com on April 15. Reprinted here for educational purposes only. May not be reproduced on other websites without permission from Thomson Reuters. 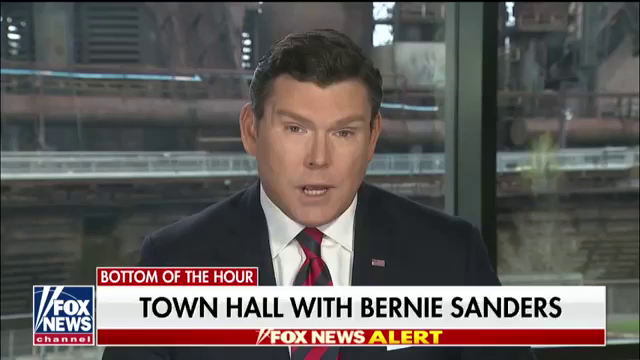 b) What caused the massive fire? c) What does Notre Dame symbolize? d) What is the significance of the fire occurring this particular week? e) What did the archbishop of Paris call on all priests in Paris to do? f) Why is the destruction of such a historic symbol of Christianity significant around the world? 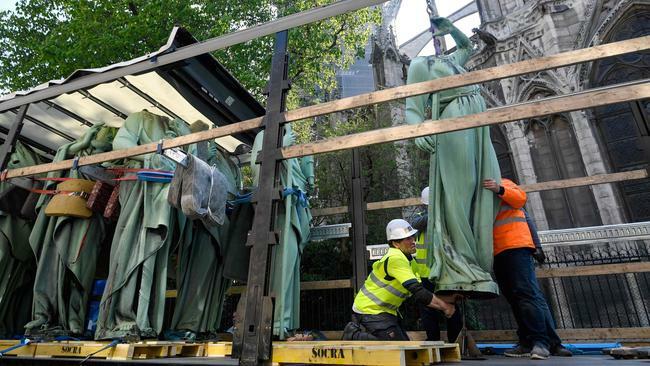 The cathedral was in the midst of renovations, with some sections under scaffolding, and 16 copper statues were removed last week for restoration. Built over a century starting in 1163, Notre Dame is considered to be among the finest examples of French Gothic cathedral architecture. A center of Roman Catholic faith, over the centuries Notre Dame has also been a target of political upheaval. “I have a lot of friends who live abroad and every time they come I tell them to go to Notre Dame,” said witness Samantha Silva, with tears in her eyes.